Who Knew Bricks Could Be Glamorous? Today’s stitch is an elegant interpretation of a classic Brick Stitch. The stitched sample uses Crystal Braid and Sundance Beads (on 13-mesh). Crystal Braid’s color palette is on the lighter side. I love that because Crystal Braid absorbs and reflects the painted color of the canvas. This simple stitch is made elegant by the addition of the beads. It would be great for clothing, water that you want to draw attention to, a rooftop, or a bedspread. I would love to see it as a christening gown with Soie D’Alger and pearls. Consider using ThreadWorx overdyed metallic and clear beads for water. If you want to dress it up even more, consider adding three beads in between the rows of stitches (instead of the one as diagrammed). Another interesting variation would be to alternate colors in the horizontal columns. Combine that with a matte bead and I think you might have a very interesting roof. There are days I am enchanted by the abundance of creativity that exists in our world of needlepoint. Today’s stitch is a wonderful way to let this beauty shine through. Today’s stitch came to me because I was distraught at the thought of covering the exquisite colors and shading in a background. I wanted something simple and elegant. (This is also a sneak peak at a soon to be announced club I’m working on, so stay tuned!) The stitched sample uses Petite Silk Lame (on 18-mesh). This stitch would work just as well on a solid background. One idea is to do every or fourth vertical column in a different color or finish for a little extra something on a solid background. This stitch would also be wonderful for any number of architectural stitches, such as a rooftop, floor, or wall. I would love to see it as a dress or coat, especially if it was a tall figure. I’m kinda into the bead to thread ratio in today’s stitch. The stitched sample is a monotone palette with three unique threads to add texture. It uses Petite Silk Lame (black lines), Kreinik Metallics Fine Braid (size 8) (turquoise lines), Crystal Braid (gray lines), and Sundance Beads (aqua circles). This stitch will explode into something spectacular when you mix colors. It will make a gorgeous dress with a pink Trebizond Silk (black lines), red Fyre Werks (turquoise lines), pink Entice (gray lines), and gold beads. How about a dramatic bird tail with turquoise Soie d’Alger (black lines), orange Kreinik Metallics (turquoise lines), orange Silk Lame (gray lines), and purple beads? You can also up the bead glam by using Swarovski round crystals (2mm or 3mm), one of my very favorite embellishments. It will make an interesting water stitch, especially if the water is slightly choppy. For water, I would return to a monotone palette and use a Petite Silk Lame (black lines), a Kreinik metallic for both the aqua and gray lines, and clear beads. Hello Wednesday. (You snuck up on me there.) Little did I know that last Sunday’s post was going to provide more inspiration for this week. 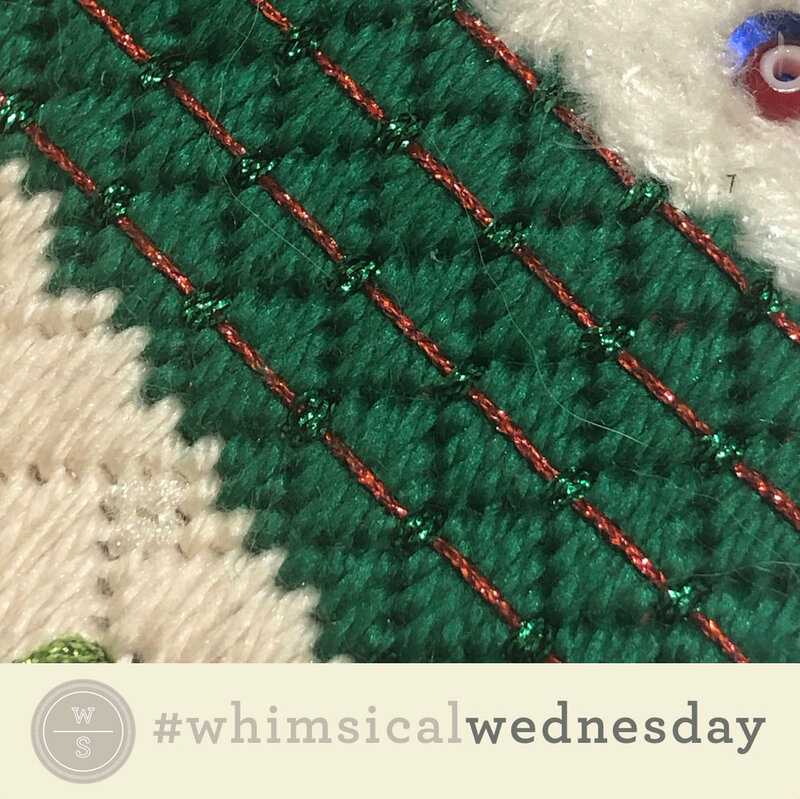 Today's stitch comes from the same Melissa Shirley tree skirt as this week’s #smallspacesunday. The stitched sample uses Vineyard Silk (black lines), Kreinik Metallics Tapestry Braid (#12), and Kreinik Metallics Medium Braid (#16) (turquoise lines). It’s the coat from one of the Santas. The sequence is important here. Start with the black lines, follow with the gray lines (from edge to edge) and end by tying down the gray lines with the turquoise lines. There are two schools of thought here. The first is as diagrammed, leaving one intersection empty during the first step. This intersection is covered by the final step. (In the stitched sample, it is covered by the green metallic.) The other idea to consider is to stitch that intersection with the same thread as the black lines. Proceed with the rest of the stitch as diagrammed. The difference is the turquoise lines (or green metallic in the stitched sample) has a small bit of elevation and texture. This full coverage stitch makes wonderful clothing (as illustrated). Change the finish of the thread for the gray line and you could have a very interesting ground cover or tree. For ground cover, I would love to see the thread combo of Bella Lusso Merino Wool (black lines), Gloriana Princess Perle (gray line), and Vineyard Silk (turquoise lines). I am a complete square…always have and always will be. But today’s square stitch, unlike me, is very cool. The inspiration for today’s stitch was an embroidery diagram I found on Pinterest. It’s another example of what I call Pattern Stitching. I wrote several posts about that a couple years ago (here, here, and here) that provide you with additional insight and ideas for pattern stitching. The precise pattern makes a beautiful floor, especially if there is gorgeous shading to be shared (as the stitched sample illustrates). A tone on tone version, while more subtle, serves well as a back drop, such as a sky, wall, bed or seat cover, or roof. The stitched sample uses Princess Perle on 18-mesh. I like single strand threads for stitches like this. I like the added height that single strand threads, such as perle cotton, silk perle, single strand silk, and metallic braids add to an area. Beads change everything. Enough said. Today’s stitch is the elegant and very close cousin of this stitch on a Melissa Shirley apple purse. 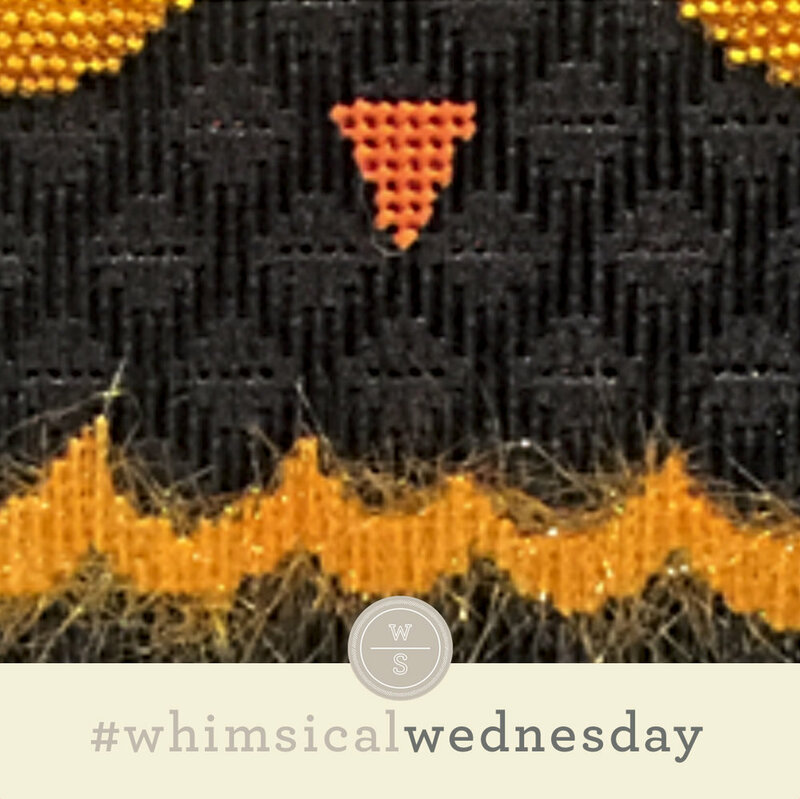 It uses a single strand of Petite Silk Lame (black lines) and a Sundance Bead (yellow circles with black lines). This stitch is great for any area where you want to accentuate the canvas shading. The addition of a bead adds nice texture, meaning it would lend itself nicely to most clothing. For a richer look, consider increasing the weight of the thread to a Very Velvet or single strand silk. Just make sure you use an appropriately sized seed bead (size 11 at a minimum). When I picked up stitching again in the mid-’90s, I insisted every single intersection on canvas be covered. Every. Single. One. The good news? I got over it. A patient teacher and shading on canvases from artists such as Melissa Shirley, David Galchutt, and Lani changed my mind. Today’s stitched sample illustrates why I am so grateful I got over it. This stitch would be great for clothing, holiday bags, and even greenery. Consider a silk floss for the black lines, a Kreinik 1/16” ribbon for the turquoise lines, and a small Swarovski crystal for the bead for clothing. To create a more matte look for a holiday bag, use a single strand silk (black lines), Very Velvet (turquoise lines), and a Sundance matte bead for the bead. If you want to use this for greenery, consider Silk ‘N Colors overdyed silk floss (black lines), a solid color silk floss (turquoise lines), and a contrasting color bead for the bead. Today’s stitch is beautiful…and deceptive. The truth is that it is far easier than either the diagram or the stitched sample portray. Once I saw the pattern as blocks of diagonal stitches six rows high instead of separate blocks of red stitches (three rows high) and blocks of pink stitches (also three rows high), it all came together for me. It took a couple false starts before this was obvious to me. I think the effect is far more dramatic if you use contrasting colors (as the stitch sample illustrates) versus contrasting finishes in the same color family. The stitched sample is me playing on blank canvas with Very Velvet (aqua lines) and Shimmer Ribbon (black lines). This is truly an all purpose full coverage stitch. It would make a wonderful pair of pants with a Gloriana Lorikeet with a Vineyard Silk a or a Soie D’Alger paired with a Gloriana Pashmina. It will make a great tree or ground cover with a combo of a solid Burmilana and a ThreadWorx overdyed Floss or Perle Cotton. Consider using it for a wall with lightweight thread combos, such as size 8 or size 12 silk or cotton perle along with a lightweight metallic, such as Petite Silk Lame or a size 8 Kreinik Metallic.